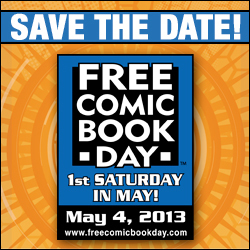 Free Comic Book Day – May 4th, 2013! Don’t forget folks that tomorrow is Free Comic Book Day at your friendly neighborhood comic shop. Most stores should be participating in this free event but if you want to make sure, head on over to freecomicbookday.com to see which stores are. This is a great opportunity for you to take the kids and get them interested in reading and even art. I know when I was younger, comic books really got me into drawing more than I did and definitely got me into other aspects of art as well. Anyways, this is a yearly event so if you can’t make it this year, just remember that it will happen again next year on the first Saturday of May.